10 class meetings with no class meeting on 2/18/2015. In this lecture, we cover more on Core Motion, Core Location and including maps into your applications with MapKit. In class we spend some time with storyboards. We look at the latest trends with analytics and crash reporting. In this lecture, we covered documentation using the JDoc standard. Most apps have a number of images included to support the UI, layout and basic functionality of the app. We covered issues related to the many screen sizes and aspect ratios that affect how images behave within the app. We covered device hardware: Compass, Accelerometer, Gyro. The Core Motion API was covered. Homework 9 (Optional): Catch up on all the other assignments! Go back and review your work from previous assignments. The fundamentals of any iOS app of any type can be found there. In this lecture we cover integrating multimedia into an application using MPMovePlayerController. See Example_Video.zip for an example of playing an .mp4 video file from the app bundle. In class tonight, two open source network frameworks were mentioned, AFNnetworking.com and ASIHTTPRequest. It might be good to download these for an example of how to build networking code, for a handy resource to include within your app, and because they are popular and you may run into a need to support them. or a feed or datafile that you create. As a bonus, you might want to mess with downloading our slow image in a background thread: http://ucla2014.certifiednetworks.com/slowimage.php?seconds=10 . In this lecture, we continue to look at drawing within our own custom UIView objects. The drawRect method of a custom UIView provides a context into which you can add objects using the Core Graphics C library. The Core Graphics API is known as Quartz, Quartz 2D or QuartzCore. Behind every UIView is at least one CALayer object exposed as the .layer property. CA (Core Animation) layers provide a rendering pipeline for the contents of a UIView that is handled by the onboard graphics chips, freeing up the CPU for other tasks. CALayer also calculates intermediate positions of UIView objects when you change a property within an animation block. Core Animation Programming Guide at apple.com is a great reference for Core Animation in general and in getting started with CALayer objects. In this lab, you will investigate drawing custom UIView objects with Core Graphics and CALayers. Many of the more creative iphone and ipad applications use this technique to create a unique and dynamic user interface. In this lecture, we look at classes that act as parents to UIViewControllers. In the first tab, implement a UINavigationContoller that holds a UITableView. Slide in a detail screen when a row is clicked. As a tip to help you complete the lab, consider implementing each view in a small application independently. 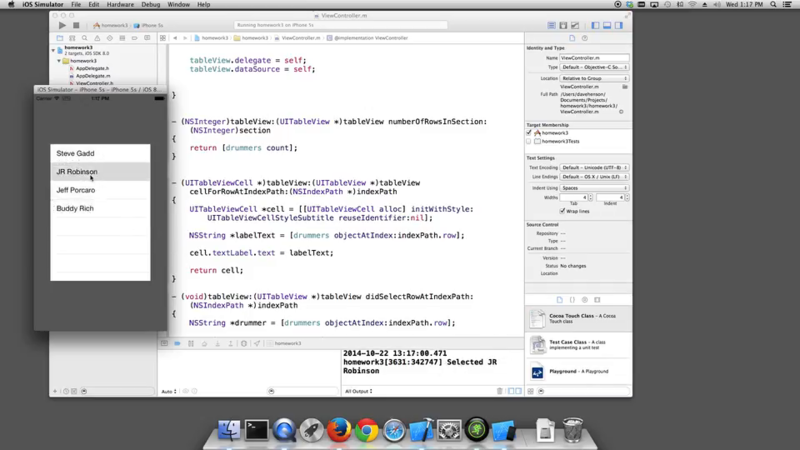 Only add the UIViewController to the UITabBar application after it is complete and working properly. For example, make a simple view-based app with a scrollable image. 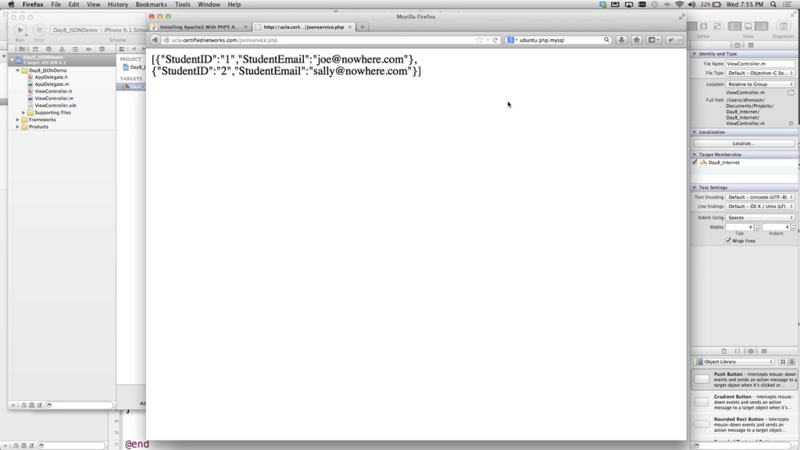 After it is working properly, drop that view controller source code into the final tab based application. In this lecture, Foundation classes are covered in more detail. The design patterns of delegation that allows objects to communicate with each other is discussed. The delegate design pattern is demonstrated through implementation of a basic UITableView object and through implementing a .delegate property on a custom class. After you get it working, use the appropriate delegate method to change the height of each UITableViewCell to be 100 points. The UIView hierarchy is reviewed, and a few specialized UIView objects are demonstrated. 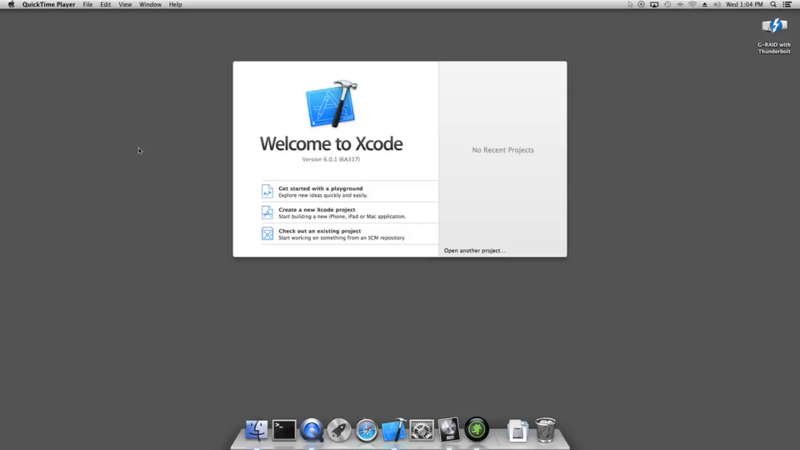 Install the current production version of XCode - Version 6.0.1. This will likely need to be updated before our class is over.